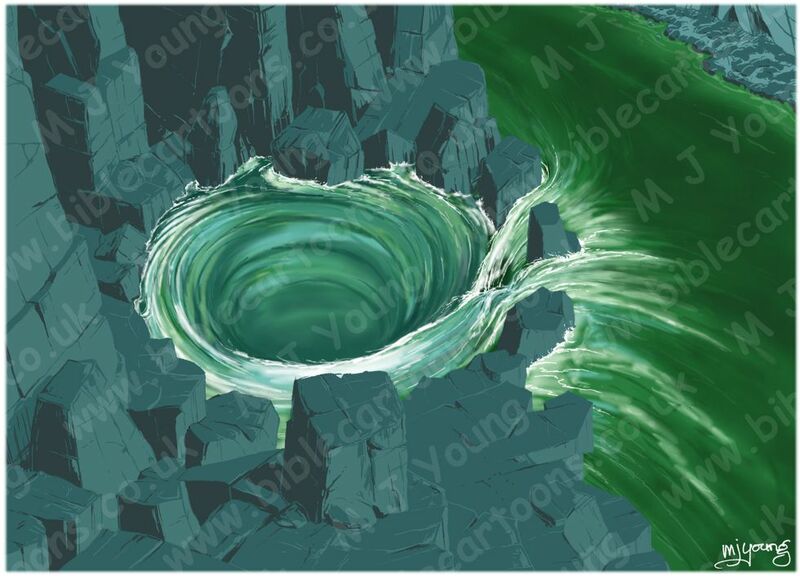 I had a strange dream the other day (27/12/2011)… I was clambering through some underground caves and caverns with a group of people, when I came across a deep green coloured underground river, which fed a large whirlpool. In my dream I swam across the river, rather than entering the whirlpool, which sounds pretty sensible to me! But then I turned & swam back across the river and stood above the whirlpool. A university friend (who I know in real life!) was with me and he looked at me blankly, not able to comprehend why I had re-crossed the river and was even contemplating jumping into the whirlpool. Next I jumped into the strong, circulating current, even though I knew I couldn’t get anywhere, except going round and round! I clung on to a jutting rock and was a bit scared. Then I realised if I let go, the current would sweep me round and round, but if I kicked and swam hardest at a particular point in the whirlpool (where the current swept me closest to the centre) that I could swim outwards, to the relative safety of the outer edge of the circulating current. …what does the river mean? I think the deep green river represents problems, difficulties, and things I find hard to understand or overcome, in real life. In recent months I have found it difficult to figure out how to market/promote the Bible Cartoons and I have been increasingly concentrating my efforts on doing the “sensible, logical thing” – which is reading a lot about business, business practices, marketing, branding, search engine optimisation, etc & acting on that information. What does my university friend represent? I think the university friend, in my dream, represents my logical, problem-solving self, as opposed to the fluid, artistic, sub-conscious self. In real life, my logical side has dominated my thinking over the past few months, justifying all the time I have spent on researching business practices, by saying that once I understand it all, I will be in a far better position to promote the Bible Cartoons to as wide an audience as I can, with the maximum impact and best chance of success. I can see the logic and rational side of that argument and I agree that this course of action seems the best. It is all about getting as far as possible, as fast as possible – hence it is entirely destination-focussed… get “there” as fast as possible! One of the problems with that destination-focussed approach, is that it doesn’t allow any time to ponder the quality of the journey itself. Being entirely focussed on “getting there” maximises my attention on the eventual destination, but allows no thought to the experiences & quality I have on the journey to that destination. A mind that is focussed entirely on the horizon can’t appreciate the scenery passing by as the journey unfolds! … And I want to enjoy the journey, not just the destination! The fact that the university friend (in my dream) didn’t understand why I would choose to return to the whirlpool, seems to support the idea that something else was motivating me to do that… something that the logical, left hemisphere side of my brain couldn’t understand, and didn’t agree with. What does the whirlpool represent? I think the whirlpool, in my dream, represents creativity, circulating ideas, sudden, spontaneous urges, powerful, tumbling, almost chaotic intentions. An environment where (the illusion of) control will be stripped away. Certainly the whirlpool was a bit scary: especially the thought of diving into it’s powerful current, with no certainty that I would be a strong enough swimmer to get out again! No wonder the logical side of my brain didn’t want me to return to it! The whirlpool was scary, but also attractive. It was dynamic, powerful, chaotic, it had a power of its own, it was untamed, independent, and because it couldn’t be controlled, it annoyed the logical side of my brain! The logical side always wants to control and direct. The right side of our brains is where creativity is hosted, but it “suffers” from having no vocabulary, no words to utter, in its own defence. Feelings, urges and emotions (and dreams!) are the means by which the right side of our brains make their selves known to us. But the logical, time-based, rational left side of our brains try to get us to ignore the right side! Choosing to return to the whirlpool and deliberately jumping into a circulating current seems daft to the logical side of my brain, “Where will that lead you? You’ll just go round and round and get nowhere!” it says, “All you’ll get is tired out, and you won’t achieve anything!” On the face of it, that seems true too! There must have been an unconscious, illogical, feelings-motivated reason that my right hemisphere wanted to return to the whirlpool. Deliberately ignoring my university friend, in my dream! I chose to look into my university friends face, but then to ignore his non-spoken urgings to continue on to the next cave (the next problem-solving opportunity.) Something important could so easily have been overlooked, if I had chosen to continue on my caving journey. But instead, I chose to ignore the logical, rational side of my mind, and jumped into the whirlpool. I think the fact that I did that, in my dream, means that I have a powerful desire to return to the most important aspect of Bible Cartoons: the creativity. I think the whirlpool is my desire to immerse myself once more in the enjoyment and spontaneity of drawing and colouring the cartoons. I think I have been concentrating on the business-side of the Bible Cartoons a lot over the past few months, and I have been focusing too much of my time of trying to control the creative side of my mind, and forcing it to adhere to the logical, rational, (and rather obvious) left side of my mind. So that is what I’m going to do! I’ve just finished this corel PHOTO PAINT image of the scene in my dream, to show you what the scene looked like… sort of!